This two day combo lets you experience the rich history and legendary sights of Philadelphia with ease! 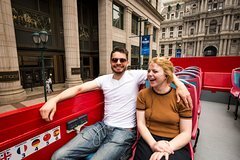 Your combo includes a hop-on hop-off sightseeing tour as well as admission tickets to two of Philadelphia's top attractions: the notorious Eastern State Penitentiary and the sky-high One Liberty Observation Deck. See the best of Philadelphia with this two day tour and attraction combo! Expert local guides offer live commentary aboard an open-top, double-decker bus (covered trolley in the winter and inclement weather). Enjoy fact-filled narration as you travel a 1.5-hour loop to 27 different stops, highlighting Philadelphia's 100 most popular attractions, including the Liberty Bell, Independence Hall and the US Mint. Aboard the double-decker bus, a 360-degree view of Philadelphia will leave you speechless and entertained while you soak up the history, heritage and beauty of one of America's oldest cities. Travel at your leisure with this 2-day pass that allows you to explore the city with the added value of transportation throughout downtown Philadelphia. Included with your pass are a one-day admission ticket to Eastern State Penitentiary (once the most well known prison in the world) and a two-day admission ticket to the One Liberty Observation Deck (offering sweeping views of Philadelphia you can enjoy twice in two days).